Brazil will make their Twickenham debut on Saturday 9th July as part of a fresh line-up at the newly-sponsored Vauxhall Middlesex Charity Sevens, writes Lesleigh Mudaly. Brazil will join Esher (Middlesex Clubs Sevens winners), Durham University (BUCS National Sevens winners) and seven-time champions London Scottish, under ex-IRB Sevens Player of the Year Simon Amor. The British Army, victors in 2001 and 2004, line up as usual while holders Samurai will be one of several National Sevens Series teams on show, with only a handful of Premiership clubs expected to compete. But it is Brazil, one of three national sides invited alongside England (under the Help for Heroes banner) and Wales, whose appearance catches the eye. The South Americans are embarking on a five-year development programme designed to help them qualify for the Olympics sevens event in Rio de Janeiro in 2016. 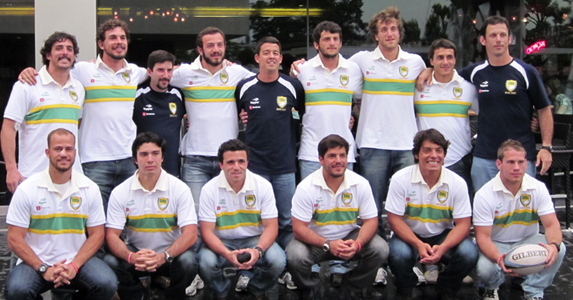 They finished third in the CONSUR Sevens, on the way becoming the first South American men’s team to beat an (albeit second-string) Argentina side since 1936. That tournament was shown live on Brazilian TV, evidence of a desire to grow the game and help the men bridge the gap on the world’s elite – Brazil’s women have long been a force in sevens. We met up with the Brazilian team at Las Iguanas on the Southbank as they took a break from their tournament preparations and they can’t wait to run out in front of a large crowd on Saturday. There are only 8 dedicated rugby pitches in the whole of Brazil!